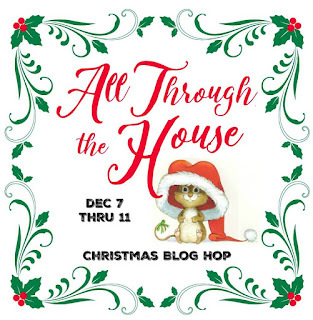 Today is the first day of the All Through The House Christmas Tour hosted by Jennifer at Town and Country Living and Barb at The Everyday Home which runs all week with a different room featured each day. You'll find all the links at the end of the post. Today it's all about our foyers or porches. What has snow, a sleigh, a reindeer, some bottle brush trees, a few ornaments, a lantern and a pretty wreath? My foyer decked for Christmas, that's what. 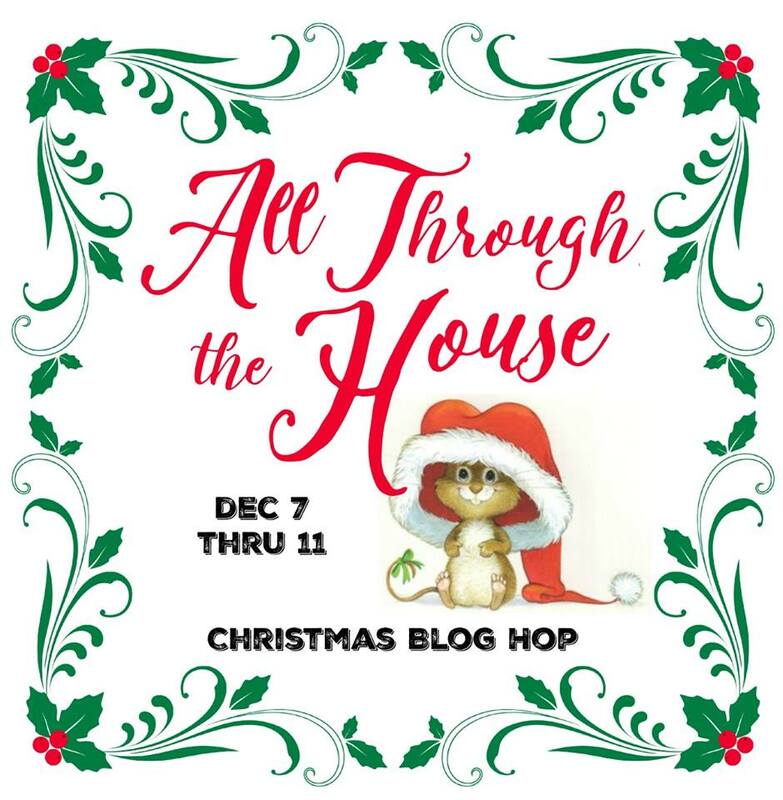 Every year I like to change my Christmas decor up a bit and when I knew I was sharing my foyer in this blog hop this idea using the reindeer and sleigh that I already had popped in my head. Of course a little plaid got tied around the reindeer's neck. I reuse the blanket of snow each year. I just roll it up and store it in a plastic bin. I placed a few bottle brush trees in the snow. I usually end up hopping from one thing to the next when I'm decorating and I had these ornaments in my hand and set them down in the snow to do something else and I liked them there so I left them. I love accidental decorating. I put the lamp away and brought out this old lantern. It's hard to see, but I have a string of lights in the sleigh that change colors when I have them on at night. Across from the chest I placed this antique Belgian bulb basket and filled it with a live tree. I placed this pillow that I've had for some time on my antique French chair. I hope you enjoyed the tour of my foyer. Check out my foyer for 2014 here and 2013 here. You'll see I have a thing for deer. Be sure to click the links below to see much more in today's tour. You always have great touches in your foyer, Kim. I'm in love with that Belgian bulb basket. You have a knack for finding unique items! Thanks for joining the tour! The foyer vignette is beautiful as always....beautiful in every season....and so gorgeous on that magnificent French buffet! Beautiful and WELCOMING foyer this year and every year! Love the deer and sleigh. I am featuring deer this year:) And PLAID, and leopard print:) Fun decorating this year! Have a beautiful day! I love the woodsy theme you have going on in your Christmas decor this year. It suits your house well. The antlers on the wall above your chest coordinate well with your Christmas decor also. Hope you're feeling better today! So pretty, Kimmie! I just love how your decorate! It's all beautiful, Kim! I love that wooden piece of furniture. Lends a natural and rustic look to all the pretty finery! I have not one bit of plaid, but I can't leave Abi to go out. Let me know what your vet says today. I just adore that live tree in the basket! And that deerscape on the chest is beautiful. The grandkids will love it! LOVe the snow and wreath you added Kim and that tree in the basket? I'm stealing that idea for next year! Beautiful! Your foyers looks like it is welcoming the Christmas season in perfectly Kim! What a great idea to do a tour room by room! Your foyer looks great Kim! The table looks beautiful and I love the live tree by the stairs! Love your reindeer. So pretty. Kim, it's lovely and that reindeer is delightful. I think the thing I am most in love with is that stunning cupboard/sideboard, whatever you call it, it's amazing. Kim your entry looks so beautiful! Love it all! always....beautiful. I wonder if the mouse and the deer would get along? Looks beautiful! Accidental decorating is always the best! Love the tree in the basket! Every time I see your French buffet in the foyer I swoon. And it looks so beautiful decorated for Christmas! LOVE the tree in the french basket!!! Your home looks all ready for Christmas! LOVE your vignette Kim! Your Deer is so cute!! Love your tree in your French basket too! Your reindeer decor is charming:-) I really like the X-mas mood you created in the house. So lovely Kim! I especially love the tree in the basket by the stairs - really charming!! Thank you for sharing! The reindeer is so pretty. Such a great way to greet your visitors! Just love it, Kim! I've never seen such a cute sleigh and reindeer.